Fresh Air Furnace Services is happy to provide another way for you to keep your home feeling clean and comfortable with our carpet cleaning services! Much like how the air in your home can be filled with pollutants that circulate through your vents, your carpet also collects dirt, bacteria, and dust that builds up when you don’t take action. While regular vacuuming can help for consistent cleaning, it is ineffective against pollutants ground down deep into the fabric. Whether your carpet is stained or just needs to be freshened up, you want only the best products and tools available to ensure that your carpets are healthy and spotless. We have spent endless hours evaluating different cleaning equipment to use for our clients that would provide the best results while being environmentally friendly. Fresh Air Furnaces uses Benefect cleaning and sanitization products! Not only does Benefect remove stains fast and leaves your carpets looking brighter than ever, these products are also environmentally friendly and safe for use around children and pets. We don’t just use high-quality cleaning products in our work; we also use one of the most powerful carpet cleaning machines available. 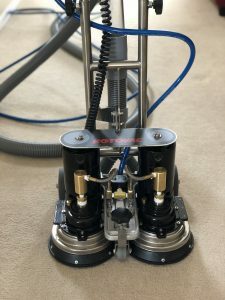 While most traditional carpet cleaners use regular manual wand attachments, Fresh Air Furnace uses the highly powerful Rotovac DHX Powerhead coupled with one of the most powerful extractors available on the market! The Rotovac DHX can restore even the most heavily muddied carpets with a deep and thorough clean. 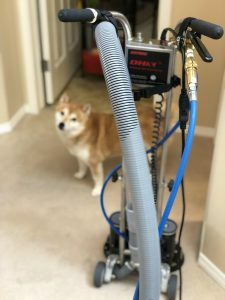 While most carpet cleaning services will simply use water mixed with detergents, a handheld wand, and no pre-treatment, Fresh Air Furnace uses a two stage process for cleaning. In Stage 1, we pre-treat your carpet with an eco-friendly solution. In Stage 2, we follow that up with hot and detergent-free water to thoroughly clean your carpet with our Rotovac Powerhead. Fresh Air Furnace Services won’t just ensure that your carpets are properly cleaned—we also offer mattress and furniture fabric cleaning. With our carpet and furniture cleaning services coupled with furnace and vent sanitization, your home has never been more clean and healthy! We recommend you have your carpets cleaned once a year to prevent dirt and stain build up. If you think it’s time to have your carpet cleaned, you can contact Fresh Air Furnace for a complimentary quote at 403-452-9528 and at info@freshairfurnace.ca. If you’re interested in our carpet cleaning services, then ask us about our specials on carpet and mattress cleaning!